Where have I been? What a lax attitude to blogging. It might be fair to say that I’m recovering, after a period of intense dining that firstly almost did me in (in the happiest way) and then propelled me onto a diet (less said about that, the better). I’m also working with a chocolate company at the moment. Cooking, eating and thinking about food had slightly taken over from writing about it for a while. But it would be a shame and probably a disservice to not document The Week of The Burger. It was a while ago now, but not easily forgotten. Technically it started on the Sunday at a friend’s birthday party, with regulation bbq burgers. The next day, it was Burger Monday. Off to Byron in Islington for El Doble – a double patty and some of Daniel’s special El Doble sauce. As Daniel says, the secret to Burger Monday is the extras that you get such as off-menu combos, and the company. It’s recommended. We went to the 9:30 sitting, ravenous, and managed to devour an admirable amount of sides too. Tom was on hand to keep the beers flowing too, with a round on the house. If you’re a burger fan then I’ll bet good money you’ve already found Byron, especially as branches are popping up like mushrooms at the moment. Canary Wharf is spacious and the closest to me, so will probably be my most regular haunt, but I still like what I consider the original, on the site of the old Intrepid Fox in Soho. The loos in Wellington St win Best Set Decoration prize. Tuesday, the burger theme continued, with Sunday’s party bag (we got sent home with much of the uncooked meat) being turned into more of a meatballs affair with lush tomatoes from Natoora. We made a piquant sauce – I think some of our takehome El Doble might have made it in there along with enough fresh chilli to remove most of my tastebuds. So good, so [much] protein, so far. We hadn’t planned Wednesday but Mr D (and half of Twitter) pointed out that Yanni would be at the Florence in Herne Hill. The Meatwagon is literally a moveable feast, as long as you manage to get there early enough and hope that the previous however-many order tickets he’s issued don’t have seventeen items on each one. That night I bumped into an old uni friend who’d been to the previous Meatwagon Florence night, and hadn’t managed to get served. She’d arrived first in the queue that evening. That’s dedication from a woman who’s six months pregnant. We didn’t get served til almost 10:30, having arrived at 7:15pm. Luckily there were plenty of amenable people around to chat with. And Mr D popped out to chat about something around 9:45 and somehow managed to snare a ‘spare’ burger – I didn’t ask – so I didn’t quite resort to eating beer mats. When the food did arrive, after an utter absence of conversation for about ten minutes where we simply stuffed our faces and felt the rush of blood sugar topping up, I made Mr D promise to not let me order a burger next time, because the Philly Cheese is unsurpassable. (Bear in mind I’d had half a burger already so might have been distracted). I have a funny feeling that there might have been a burger on Thursday too and I’ve just blocked it from my mind. For Mr D’s birthday, I’d booked a table at Bar Boulud. Much lauded chef, equally hyped burgers. We went with the Piggie (bbq pulled pork on top of the patty) and a Frenchie (confit pork belly) and while I’m almost more tempted to bang on about the amazing charcuterie, they were delicious, beautifully presented and delivered promptly. In stark contrast to the Wednesday, there’s literally no waiting around here which was one of Jay Rayner’s bugbears when he reviewed it, being asked to vacate within two hours. It suited us perfectly, served as an almost OTT brunch and we wandered off across Knightsbridge to Clerkenwell to walk it off. That was a month ago, and I’m still not sure I have worked off that week. Byron: Consistently great. Easily available. Great value. Meatwagon: Just about worth the wait. Worth getting home well after midnight. I’m a sucker for novelty too. Bar Boulud. A perfectly conceived, concept burger. Great value set lunch. Slightly surreal crowd. In fact, I’ve probably listed them in my personal order of preference. I’ll have to try one next time I’m in London. They look great. Good luck with finding the Meatwagon, it’s worth it! 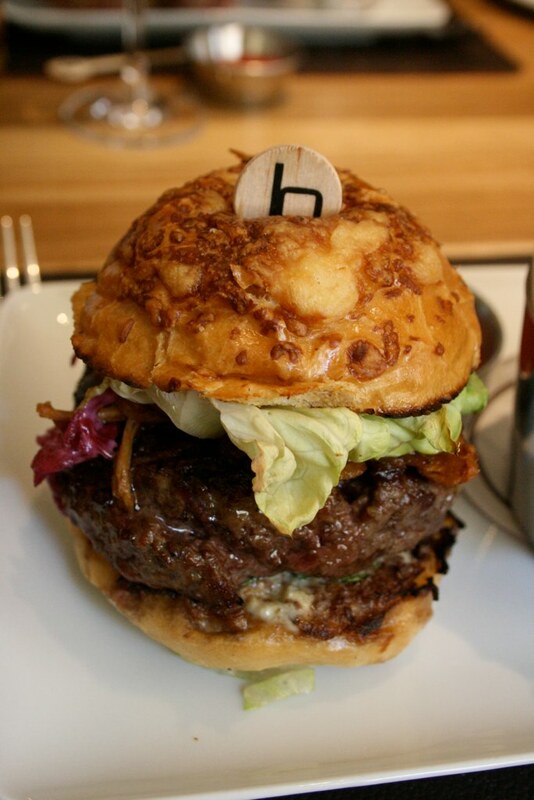 Wow – that’s a humdinger of a burger week. If you count the el doble as two (and why the hell not) then that’s a fair number of burgers to fit into seven days. And you still love them too. Like you, I love Byron burger – great value and great taste. I had my first Byron burger this week on your recommendation and I have to say that I was not blown away. Pretty average. My personal favourite is Gaucho’s — simple, elegant and taaaasty. Fred has a penchant for Boxwood Cafe’s Veal & Foie Gras burger (known to us as ‘the cruelty burger’). But I’ve just discovered they’ve closed due to relocation. What a shame – most people I know who’ve tried it are really impressed. Also you’ve got to factor in that the Gaucho ones are roughly twice the price. I rate Byrons, loving the simplicity of the burgers. I usually get overwhelmed by too many filling, where as Byrons are all about how tasty the meat is. Definitely my favourite burger. I agree – much as I’m a fan of the Meatwagon, which is great, I love the reliability and availability of Byron! Mmmm…burgery goodness. I just posted about my new fab burger in London today – try the one at the Eastside Inn bar. It’s fabulous. I can’t quite believe that we haven’t been to the Eastside Inn at all yet – now the burger is yet another reason to rectify this!